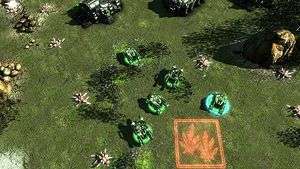 You don’t have to look far these days to find a resurgence in popularity for early-style real-time strategy games. A focus on single-player content, base-building, less micro-management, and increased focus on blowing stuff up has more in common with Red Alert and KKND than R.U.S.E or Company of Heroes. So in steps Meridian: Squad 22, with a spunky, eager look in its eye, wearing its single player content, base-building, and straightforward approach, loud and proud. Can a new IP, bearing the hallmarks of older stock, make a place for itself in a busy marketplace? Meridian Squad 22 starts well with a decent, if not well-trodden, story line – in the future, mankind had exhausted all earth’s natural resources, all its food, and is severely overpopulated. In an effort to save the human race, a team is sent to Meridian in order to check its viability as a suitable planet for relocation. The team disappears off the face of the earth (pun fully intended) and ‘Squad 22′ aka, you and your lot, are sent to the planet to find them – cue intrigue and explosions! Sure, it isn’t the most original writing but it works and the dialogue isn’t too bad either. The story is a frame for some back-stabbing and capers to take place, with some suitable flash-backs and humor installed for good measure. Not original, but well rounded, so its got that going for it. What we’re really here for is some good old-fashioned, real-time strategy action. After all, no-one played Red Alert for the cut-scenes (they were awesome though). The gameplay in Meridian: Squad 22, is plenty of fun but does come off feeling a little ‘light’ as things progress. One thing that I do like, right from the off, is how the research and development element works. Scattered around each level are various orbs and trinkets that you can collect which represent different research paths. You collect these items and combine them to spend on different upgrades. 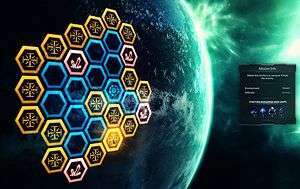 The interesting thing is that for something like increased storage of Shardium (the ‘ore’ you mine to produce buildings and units), you have to spend five green orbs in the ‘Economy’ tech-tree. However, with that same five green orbs, you might be able to use two in combination with other orbs in the ‘Combat’ and ‘Defense’ tech-trees. This poses interesting dilemmas when deciding how you will progress the structure of play-style. The dilemma is further increased when you consider that this is how you unlock the majority of your units – air, ground, and sea. Given that you’re never going to know what will come up in the next level, it’s an interesting way of doing things, but it keeps you guessing, which is good. The actual gameplay is fun, building up a decent-sized base, defending it from waves of enemies, whilst trying to build up a great enough force to go out and complete the mission. Some of these missions require merely surviving in your already set-up base while others involve going out on search & destroy missions – it’s the standard real-time strategy affair – nothing ground-breaking here. The units themselves are nicely designed and varied, which is a bonus because you’ll generally be building a lot of them in order to achieve victory. It does feel like you are just trying to churn out a greater amount than the opposition but, thankfully, attention has been made to working out a decent rock-paper-scissors formula, so you can’t just build one-hundred units of one type and march off to victory. The only disappointing thing about the units is that when the action does get going, some of it can be hit and miss. The actual moment-by-moment gameplay is fun, but some of the fire exchanges between units leaves a little to be desired. Units tend to have little to no animation once they pitch up to knock seven bells out of each other, and you’re resigned to watching lasers or shells hit something whilst waiting to see which health bar decreases the quickest. Furthermore, most of the weapons are lacking any real punch; the laser, in particular reminds me more of a cheap light-show at a school disco rather than something that could melt flesh. Probably not the biggest problem in the world but still a little underwhelming, and seeing as Meridian: Squad 22 isn’t doing anything revolutionary, it needs to be packing quality in spades. 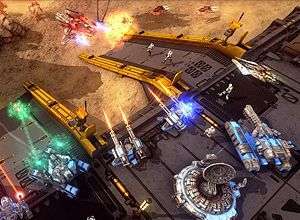 Thankfully, though, these quibbles are minor and overall the unit variety, combined with the general difficulty of the main campaign, means that you’ll overlook the shortcomings in order to enjoy what you have got – a decent real-time strategy game that proves to be tricky if you’re not taking it seriously. I would have liked some more depth though, as the units lack secondary functions and I felt like the main cast of characters that actually end up in most missions should be buffed or stronger. Instead they actually feel weaker than most of your regular units. The overall quality with the occasional dip is also represented in the graphics, which are fine except when things look a little under-par. The detail on the buildings, units, and landscapes are pleasing to the eye and there is a varied and enjoyable colour palette, but none of what I’m seeing is ground-breaking, nor is it packing any sort of ‘wow factor’. One area that I was impressed with, graphically speaking, was the cut-scenes. These were generally of a high standard and I feel they added something to the proceedings. The audio, on the other hand, is surprisingly enjoyable. I was quite shocked to find myself humming the backing music as I played, while the units made the regular array of ‘pew pew’ noises. The turrets were among the best sounding of the units, although, as I mentioned earlier, the audio from some of the other units leaves a lot to be desired. Regardless, I was further surprised by the quality of the voice acting, which enhanced the otherwise standard story. Speaking of which, when you’re done with the main campaign, you’ve got additional modes such as ‘Squad Mission’ and ‘Conquest’. These provide a large amount of extra content and make the game great value for money. Squad Mission deals with selective one-off missions, where as Conquest deals with back-to-back missions which lead you to a conclusion – think Dawn of War: Dark Crusade, without the grandstanding and greenskins. It’s a surprising addition; I wasn’t expecting this much content for the price of admission and it’s great to see that developers aren’t just wasting their time trying to shoehorn a multiplayer into their game. Meridian: Squad 22 is a very pleasant surprise, all things considered. As something that came through Steam's Greenlight program, it is a decent game that only suffers from a few mis-steps which ultimately stop it from becoming a sleeper hit. While you could probably forgive the cons that I've listed for the most part, there are some aspects that make it a little rough around the edges - such as not being able to set way-points for units or having the pathfinding be a little bit shonky, to the point that some units were getting caught on buildings I had built, parts of the scenery, or just each other. That's all okay though; I can forgive this sort of stuff because it's got charm, some fine gameplay, and generally it ticks enough boxes to make it something that you should probably be taking a look at when you get a moment. It isn't essential, but it is plenty of fun in its own right.